The Oregon leg of the Pacific Northwest adventure was brimming with new adventures, mini lectures, bonding time in the vans and even more awe. One of the first stops on what could possibly be described as the world’s best road trip was Bonneville Dam, completed by the Army Corps of Engineers in 1937 under the direction of Franklin Roosevelt. The Bonneville Dam is an exemplary site for learning about the complexities of environmental and energy issues. Bonneville provides hydroelectric to hundreds of thousands of homes and has been working to improve their salmon runs and corridors so as to better assist fish migration. Notably, dams can profoundly impact ecosystems and have the potential to affect salmon migration. In our discussion of Bonneville following our tour guide’s enthusiastic speech regarding the dam, the Williams-Mystic instructors guided us to think critically about all facets of the issue. What did the salmon say when she ran into a brick wall? Dam! Jessica (Maine Maritime ’16) and Chelsea (URI ’17) wait expectantly…. After pausing at the salmon hatchery and the breathtaking Multnomah Falls, we arrived at the Columbia River Maritime Museum in Astoria. Here we learned about the tempestuous Columbia Bar where the mighty Columbia River (some 1,200 miles long) collides dramatically with the Pacific…the sight has been nicknamed “the graveyard of the Pacific” for to its deep history of pulling ships under. Today the Coast Guard hires only the most qualified bar and river pilots to guide vessels across the treacherous bar and through the thin channel. These unsung experts make possible safe navigation and the transport of goods inland on the River. At night, we slept aboard a the decommissioned Columbia lightship, which had been used for decades to mark the bar. In between the fascinating site visits and accompanying lectures, there was a considerable amount of transit time. “Van time,” like “ship time” takes on a different quality. Hours in the van are prime for learning more about each other and the places we are visiting or passing through. While a few of my peers could be found napping, I refused to close my eyes lest I miss a moment of the glorious scenery rolling by: deep green forests of firs and ferns and dramatic cliffs with white waves crashing and foaming at the base: the Pacific Northwest is like a whole other world. Truly, everything just seems more epic on the West Coast! We met up with Susan Schnurr (F’06), a PhD student at Oregon State University, who explained the tsunami planning initiatives in Pacific coastal communities. After her presentation, we had a chance to try the tsunami evacuation route by following the signs to high ground. Unfortunately, some in our group were not fast enough to beat the terrifying rush of water that was (hypothetically) nipping at our heels… After this high-octane exercise, we sought refuge in the aquarium where I shared some deep soulful eye contact with the sea otter. Fun fact: one sea otter at the aquarium eats $17,000 worth of seafood annually– otterly expensive! Then it was back on the road. After driving along the breathtaking cliffs, we paused at the Sea Lion cave, which is in fact the largest sea cave in North America…you enter through a gift shop and walk down the path hugging a cliff to an old elevator that takes you down 200 feet to the cave. As the door opens you are greeted by the loud barking of the hundred or so stellar sea lions that are stretched across the rocks. There is a metal fence between the humans and the sea lions, but the pinnipeds pay no mind to us. This site presents a fascinating opportunity to discuss the tension between private ownership of an ostensibly public access point on the coast. Again, these on-site discussions push us to think critically about complexity on interdisciplinary matters. 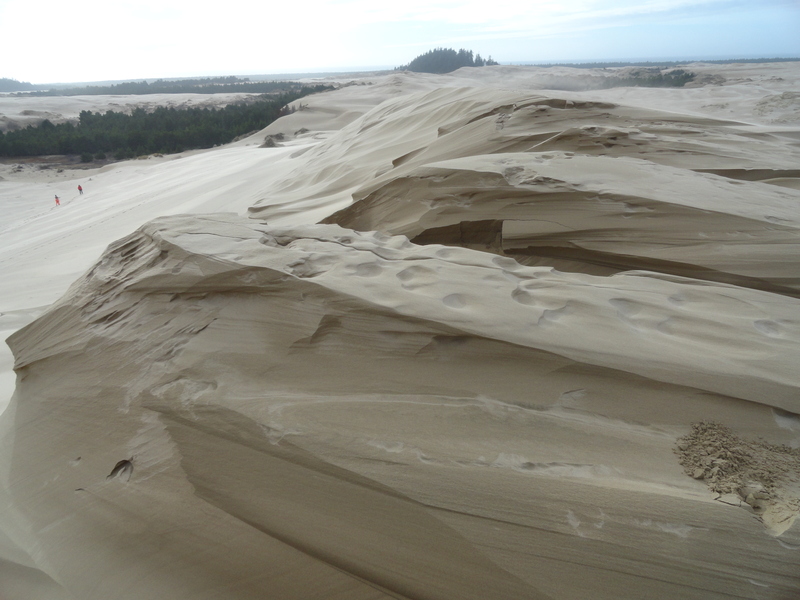 After the sea lion cave, we visited the expansive Umpqua dunes (some 4,000 acres), which looked like a rolling desert that extends some 3 miles from the ocean. There was an abrupt transition from the evergreens to the sand… quite a sight for someone used to the sloping banks of the East Coast. 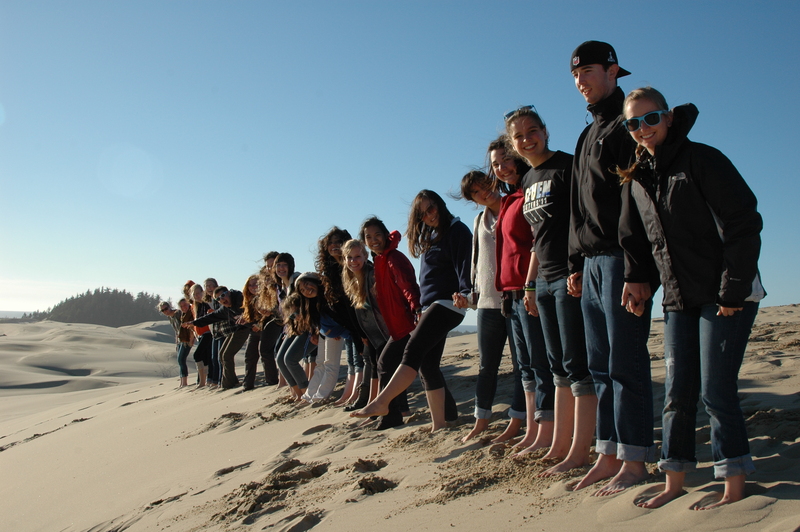 At the top of a dune, we paused for a fabulous lecture from Professor Marlo Stein (Smith ’17) about dune formation. A light rain came down, but soon it cleared and a rainbow emerged to frame our impromptu class. With Mike leading the charge the next morning, we explored the rocky inter-tidal zone in Cape Arago National Park and found a multifarious world of life clinging to the rocks: starfish, chiton, anemones and all manner of other species I can’t spell. And for the first time in the 20 years of W-M visiting the site, it HAILED! For maybe 12 minutes were all stood like sentinels facing away from the rather large pellets blowing towards us. Sophie (URI ’18) knows one way to chiton your day! What the hail! Stu (Roanake ’18) holds proof of the hail storm. 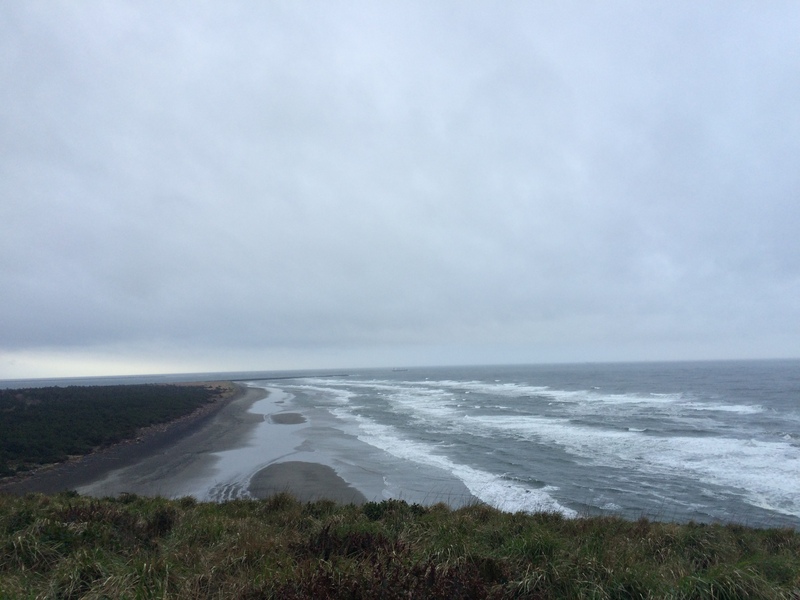 Our time in the Pacific Northwest had been at times wet, at times windy, but every moment had been thoroughly engaging. Author williamsmysticPosted on March 24, 2016 January 30, 2017 Categories Pacific Northwest Field SeminarLeave a comment on West Coast…Best Coast? Leave the Umbrellas at Home! Shortly after landing in Washington State, we mobilized “to the vans!” (a phrase that became our battle cry) and made our way into the city. We wasted no time, immediately ascending the Space Needle. From 605 feet up, we had a birdeye’s view of Seattle, our home for the next two days. After a few minutes of awe, we were down the needle for a presentation from our guest lecturer about the geologic identity of the region and some of the threats (volcanoes, earthquakes, the usual) facing a city built on the geologically active Pacific Rim. Only once we had been assured of the low risk of one of the catastrophic events striking during our visit, we set out to explore the city. Professor Mike Nishisaki led many of us on a pilgrimage to visit the blooming cherry blossoms on the University of Washington campus. After gawking for a while, we finally dispersed in search of dinner. Albion House (Sophie, Amelia, Amanda & Lizzie) thinks the Space Needle is out of this world! Sarah (Middlebury ’17) and Erica (Williams ’18) had a cherry nice visit to the UW campus. We had been warned that our umbrellas would mark us as tourists…and soon learned why. While the first hours in Seattle had greeted us with sun, we shortly became acquainted with the rain for which the area is famous. It’s not the vertical plump drops of the East Coast, but rather a wetness in the air. Thus we kept raingear or “foulies” close at hand during our visit! All days on field seminars start early…there is so much to do! The first day, however, we were granted the privilege of sleeping in until 7:30. While some hearty souls rose earlier and went on dawn runs through the city or combed the streets in search of quality coffee (very difficult to find from what I hear), others of us treasured the sleep. After breakfast at our home of the College Inn we once again charged “to the vans” and reconvened at the Port of Seattle to hear a presentation about environmental initiatives and restoration projects nears the port, which has been subject to decades of development and industrial pollutants. 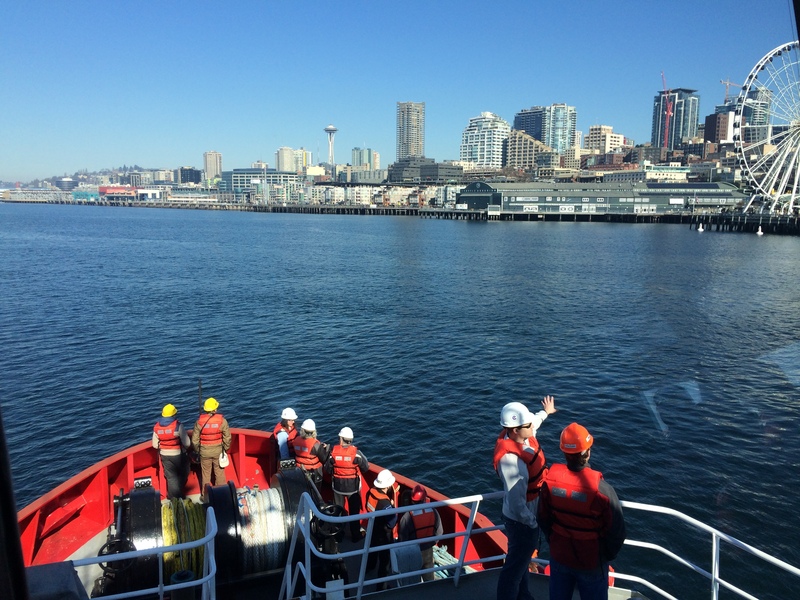 From there, we joined the Crowley team for a ride aboard a tugboat! The whole Crowley staff were incredibly friendly and fielded our many questions. Since we had already enjoyed an aerial view of Seattle, it was a treat to add another perspective of the skyline from the water. From the bow we could also watch the industrial cranes move containers in the artful cargo ship choreography. One of the many things that makes the Williams-Mystic program so special is that it discusses the practical application of maritime issues. We all come with an academic background, but to see and understand the shipping structures that supply us with the goods and commodities we use everyday is an important practical complement to our education. 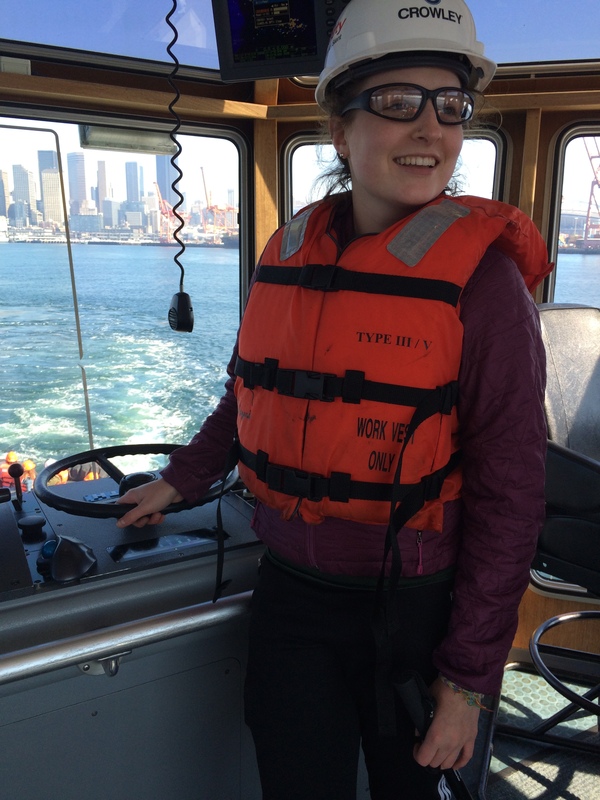 S’ 16 aboard the Crowley Tugboat. It was difficult to tug us away from exploring deck and engine room for a photo! Virginia (Connecticut College ’17) presents…Seattle! Having built up an appetite, we eagerly descended on Pike Place Market to graze the delicious options. For those unfamiliar with Pike Place Market, it is a vibrant center brimming with flowers, seafood, fresh produce, baked goods, and crafts, and, bustling with tourists and locals alike. After lunch (and taking full advantage of the free samples), we left the market and a made a stop at the infamous gum wall, which has re-accumulated an impressive amount of gum after being scrubbed clean just this past fall. Then Seattle became our classroom for our walking tour, which involved many lectures about the historical, geological and political dimensions of the city. The mini on-site lecture is foundational to the field seminar: place-based learning at its finest! Many us of carried around journals poised to jot down notes. Not sure, but I assume we all were just excited by the prospect of talking to future Williams-Mystic students after the reunion! *Please check back in a few days for Part Two: more about the Oregon leg of our Pacific Northwest Adventure, or “Moregon” for short. Author williamsmysticPosted on March 18, 2016 January 30, 2017 Categories Pacific Northwest Field Seminar1 Comment on Leave the Umbrellas at Home! 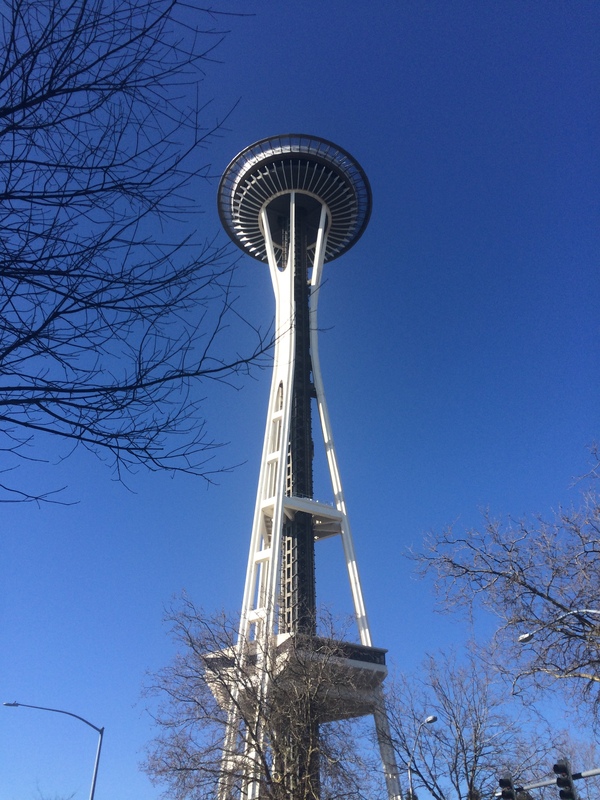 The Space Needle is not very needle-y, it turns out. 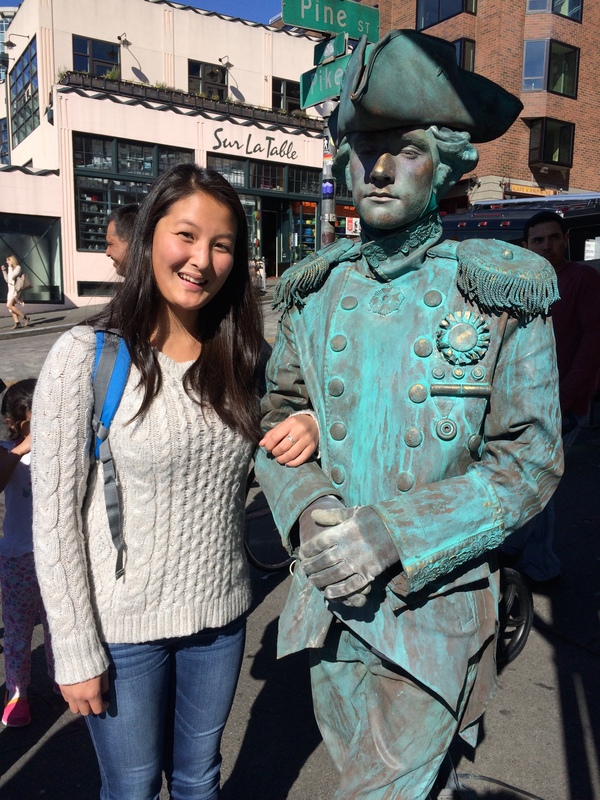 Making new friends in Pike Place Market. 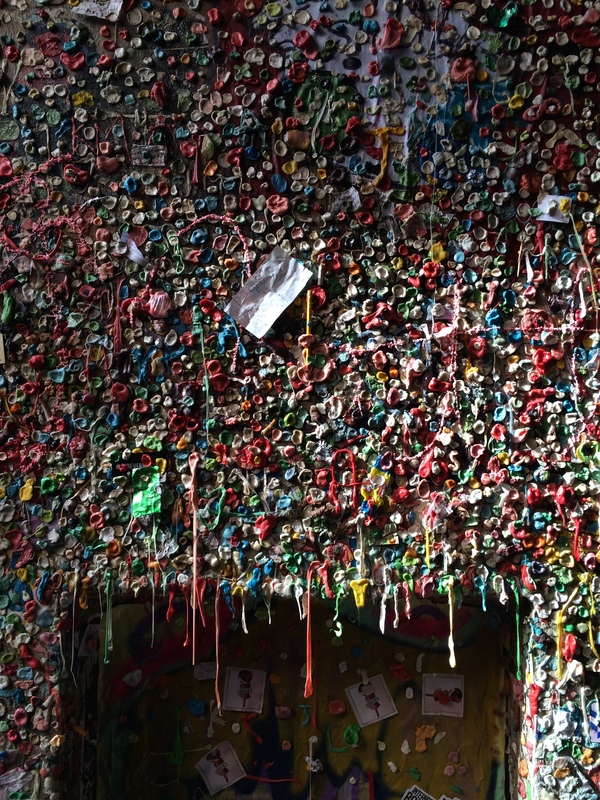 Near Pike Place and somewhere among the other countless pieces of gum is Williams Mystic S’15’s mark! A crew member from the Cramer already found us! Keep an eye out if you’re ever in the area. Yep, that’s just a volcano casually chilling (heh) in the background as we begin our road trip. 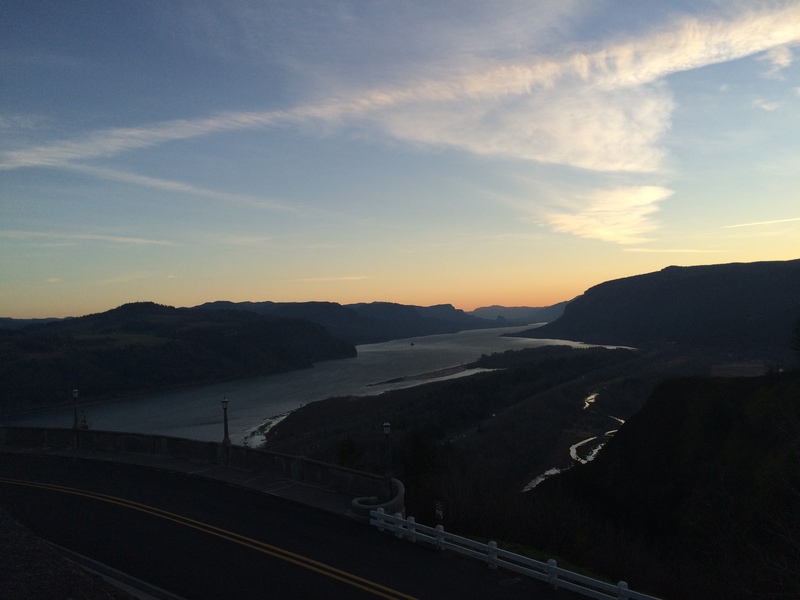 Crown Point for our first Oregon morning: A view worth a 6:30 AM breakfast. Glenn & Jim run into old Mystic Seaport friends by chance. It really is a small world! Hello, Pacific Ocean! It looks less like California now and more like the Northwest! A “desert” in the PNW. Is there anything they don’t have?! “Sciencing” it up in some tide pools. Jim Carlton establishes a portable snail exhibit. And one last view from the road. 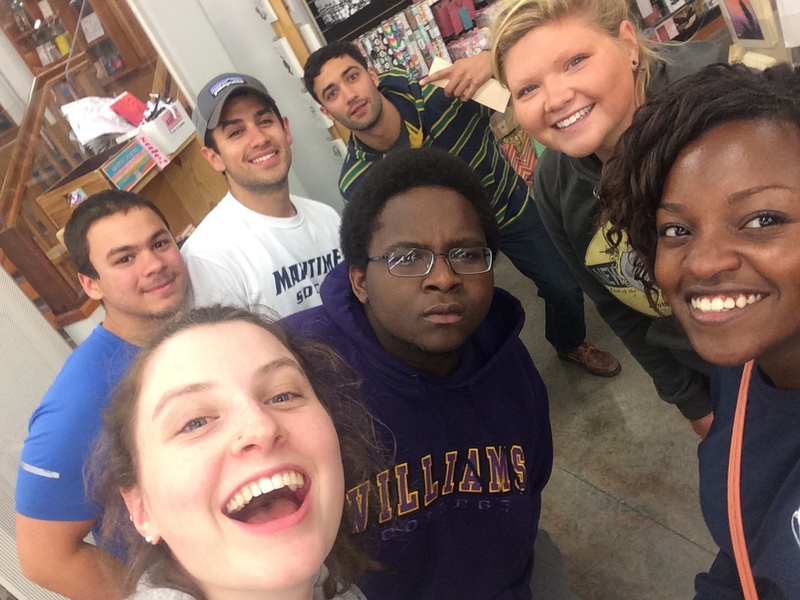 I had so much fun exploring, singing Taylor Swift and Usher with professors, and learning the ins and outs of a world I’d never experienced. It seemed like we had a thousand trips in one. It was also crazy how many Williams-Mystic alums and friends we encountered although we were literally on the opposite coast. Plus, come on, van life is just about the best thing ever. Retreating to the vans after our visit to the salmon hatchery, we peeled off layers of wet jeans and useless wool socks, letting the cars bear the brunt of the damp weather as we continued our travel south through hills and shoreline. By this point the rain had become a torrential downpour, though this didn’t stop us from visiting the community of Cannon Beach. If anything, we were forced to make the conscious decision to let loose and fly through the elements as we stepped out onto the wide stretch of sand, the waves rogue and white-capped to our right as we gazed upon the giant dark mass of Haystack Rock standing there completely immune to the water from sky and sea alike. We ran, we jumped; we fell over each other (and ourselves!) as we skipped between the incoming waves. We were seventeen college-aged children, accompanied by professors and staff that weren’t acting all that much older. It was the primal experience of nature at its finest. This is not to say that anyone complained, however, when having arrived happily exhausted at Newport that night. We were awakened the next morning by the sun’s rays passing through our hotel windows and began our next day at the Oregon Coast Aquarium. We were greeted around every corner by the colors of sea life placed prominently on display, as well as the enthusiastic staff (“You must be the Mystic program – we look forward to your visit every year!”). My roommate Jess managed to find her way behind the scenes after a casual discussion with a member of husbandry, while Tenzin and I continued our tradition of fudge sampling at the gift shop. 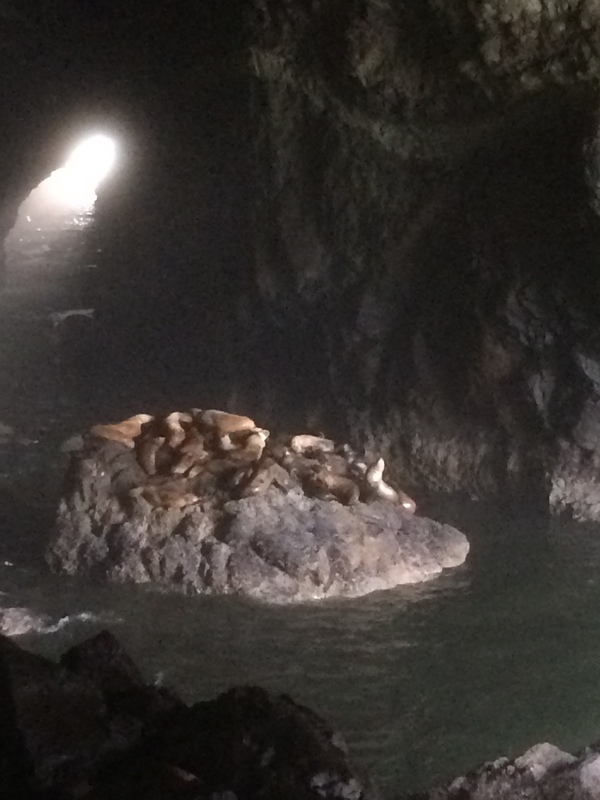 Following lunch, we departed from the Aquarium and transitioned from glass to rock walls at the Sea Lion Caves. Our descent took us down from the top of the roadside cliff to a giant hollow inside of a cliff, where sea lions suction themselves to rocks and are subjected to the wrath of the occasional cumbrous wave. Once we returned to the surface of the earth, we enjoyed scenic views of freshwater lakes and the glacial carvings of the rocks on the horizon en route to our next destination, which was certainly one of the most memorable on our trip. 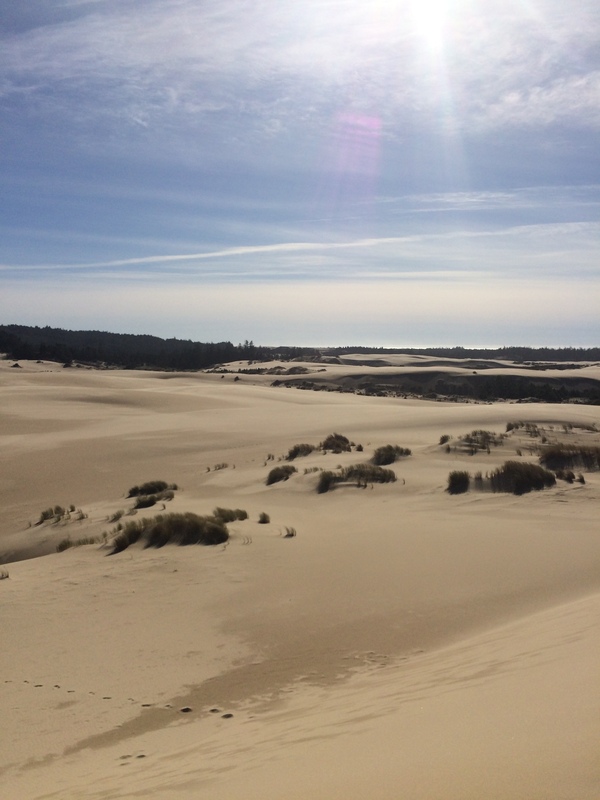 After passing several small towns advertising the sand dunes that run along 45% of the coastline in this state, we finally pulled over to explore them for ourselves. As Tenzin described it, “I’m beginning to understand what early explorers meant when they said they couldn’t put their discoveries into words.” Indeed, there was no form of language that could describe the sight that greeted us. The dunes, much like the rest of this place, were vast—the size of small mountains. At the base, the world seems made up of sand, like a desert. At the top, you arrive with sinking shoes and burning legs to see mile after mile of forest fading into mountains on one side, and expanses of sand bordered by the distant glimmering Pacific on the other. Small copses of tree islands dot the terrain carved into geometric shapes by the wind that assaulted our face and penetrated our clothing and our mouths. What’s more, the afternoon rain had halted and the sun tried its best to shine through the shield of clouds. We returned to the vans, shaking our sandy heads with awe. Our magnificent day ended as we reached our final destination in Coos Bay, where we arrived at the small complex of wood-shingled buildings known as the Oregon Institute of Marine Biology. OIMB is nestled in between a sloping wall of forested cliff and the bay itself, decorated with docks containing trawlers, purse-seiners, gill-netters, and research vessel. We were stationed there for two days of steady sunlight and slightly warmer temperatures. 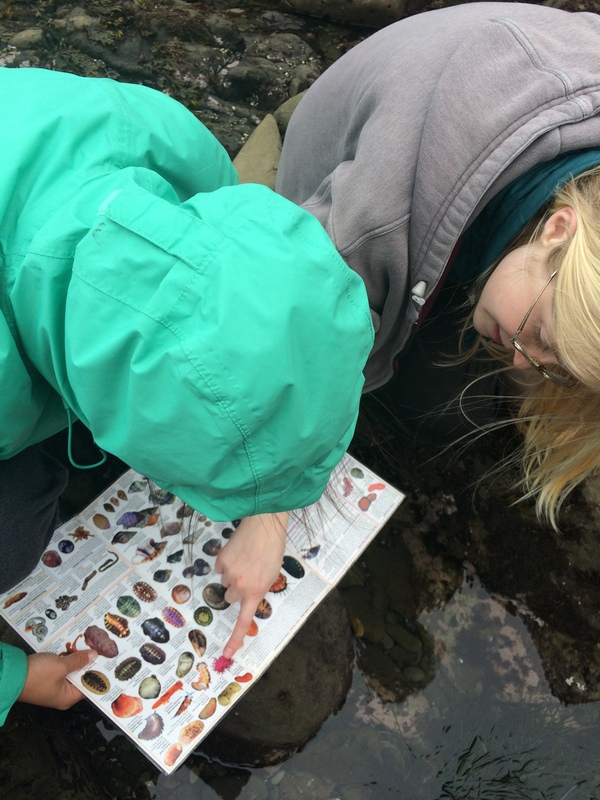 During that time we visited tidal pools, where we were met with OIMB graduate students who showed us how to leap between the algae-covered rocks as we touched anemones, starfish, chitons, and hermit crabs. 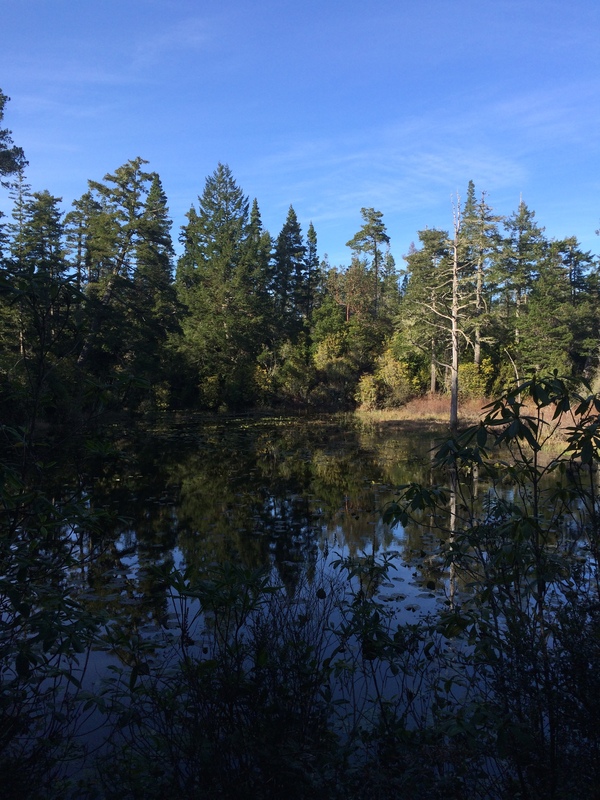 We then sought out a different source of marine diversity in the South Slough estuarine reserve, where habitat restoration of destroyed tidelands has been the focus since the 1970s. We strolled leisurely through the flat green grass of the marsh, experiencing for ourselves the benefits of man’s environmental approach to nature, before returning to OIMB for a poetry slam and Glenn Gordinier’s infamous tango session. On our last day, we were given free time before our return to Portland to spend the night. I awoke early to run, only to be distracted by the splashing of a sea lion at the end of the dock as I stretched in the bright pink hue of the morning sunrise. After breakfast, Victoria, Jess, Nellie, Veronica, Zak, and Molly took advantage of these precious free hours to return to the place where the elements collide. On the Sunset Bay Trail we were immediately greeted with the vast expanse of the Pacific, the cliffs upon which we stood offering a generous view of the rocks of Simpson’s reef (hosting a colony of talkative sea lions) on the left side and the sheer, layered face of a cliff hiding the treasures around the corner to our right. At each bend we found a view worthy of a painting: sandy rocks molded into dune-like shapes, harbor seals standing out white against their dark brown perches as they performed various yoga poses, a lighthouse obscuring the view of the blue shades of mountain in the distance. An entry in my journal reads: “I have never felt so awake, incredulous, or in touch with myself, as I sit here at the edge of the world.” I have also never felt so grateful for the perspective I gained from this trip. Like onboard the Corwith Cramer, not only did I form special relationships with my classmates based on this one shared experience, but I also was reminded of the seemingly supernatural power that nature has to soothe both body and restless mind. To feel so small in this world of the Pacific Northwest was refreshing, a sentiment I hope to carry with me as I progress through the rest of the semester and beyond. For most travelers, there is an “Aha!” moment, that instant at which one realizes they have found what they have been seeking, whether consciously or subconsciously. 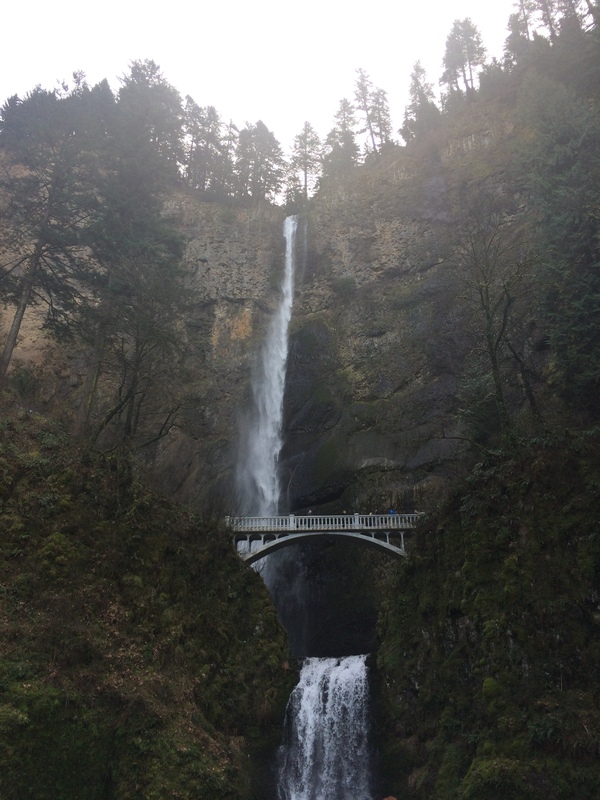 While I cannot pin mine to an exact time or place, I will say that our adventures in Oregon especially exemplified everything I had hoped to find in the Pacific Northwest. We had entered the land of giants, where small signs of humanity attempted to integrate themselves into the landscape. Our visit to Point Defiance as we drove south through Washington was a turning point in our journey, marking the moment when we were truly confronted with the beauty of our natural environment—made only more magnificent by the contrast of the industry that we had left behind. The sun symbolically emerged for the first time since our arrival on the West Coast, warming our backs and the round gray rocks that lined the crystal-clear water. The trees were almost neon-colored, their vibrant green attracting Nellie, Tenzin, and Kwasi to the steep stretch of forest that rose behind us. As we sat there, listening to Rich King read an excerpt from our course readers, we were exposed to the chilly freshness of the air tinged with pine and salt that would follow us for the rest of the trip. After a few short hours, we unhappily trudged to the vans, the image of the mountains topped with houses and water hosting tankers fading in our minds as we crossed the border to Oregon. At Bonneville Dam we learned of the controversy surrounding hydropower and the symbolic salmon of the region. I’ve never seen such verdure as I did at the base of Multnomah Falls, the algae and moss on the trees contrasting the white spray of the second-tallest waterfall in the United States. The path to the top was blocked by the destruction of the bridge by a falling rock the week before—one of the many reminders of nature’s obvious power. 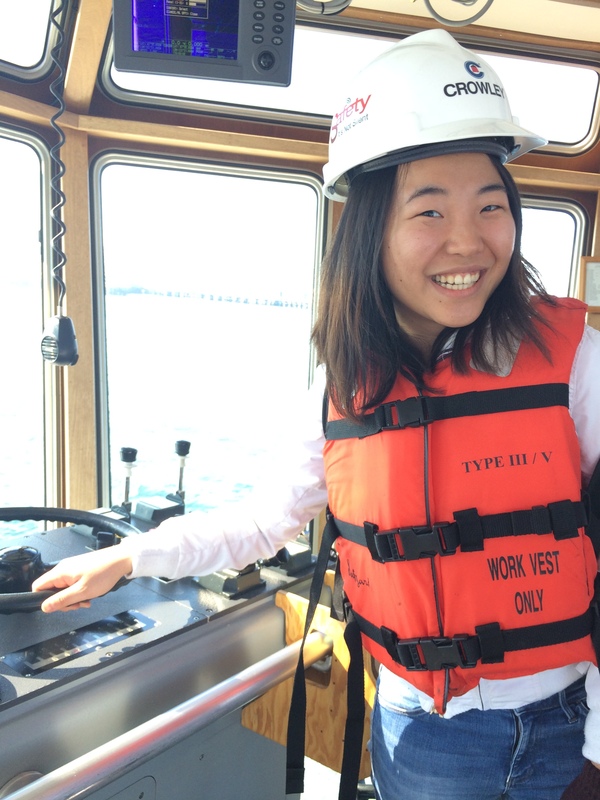 As a maritime studies program, all roads—or, in this case, Highway 101—eventually lead to the sea. After the Falls, we made our way down through the hills and fog to Astoria, a smaller-scale civilization with dilapidated, element-abused buildings on the left and newer complexes lining the Columbia River. We spent the evening learning about the treacherous Columbia River Bar (located at the mouth of this mighty river) and the souls who guide commercial vessels safely over it multiple times a day. Then it was onboard once again as we revisited the experience of sleeping on the lightship Columbia, a formerly stationed “floating lighthouse” on the Bar (by the time it hosted us, it was docked safely at the pier). The following day could be characterized by one word: soaking. Apparently rain doesn’t fall in drops in the Pacific Northwest: it comes down in sheets. The morning found us back across the bridge for a brief visit to Washington, where we attempted to see the Bar itself (though it was much less intimidating hidden in fog and pelting rain) before visiting a salmon hatchery in Astoria where we stood in our foul-weather gear as friendly fishermen taught us about the life cycles of salmon. Overall, the salmon were a large focus of our studies while on the West Coast, as they represent a failing resource that was once vital to both the native populations and white newcomers hoping to profit from the untouched land. It was refreshing, however, to understand just how proactive humans can be when faced with such an issue; there was no “hush-hush,” no cover-up, no pretending that life could proceed as normal without a crucial part of the ecosystem. Those we met, from the waiters serving locally-caught fillets at Pike’s Place Market to the fish counters at the Bonneville Dam to the elderly volunteers at the Oregon Coast Aquarium, reminded us time and time again of how magnified the controversy surrounding the salmon fishery has become. It is being discussed, examined, and as a result, potentially even solved. 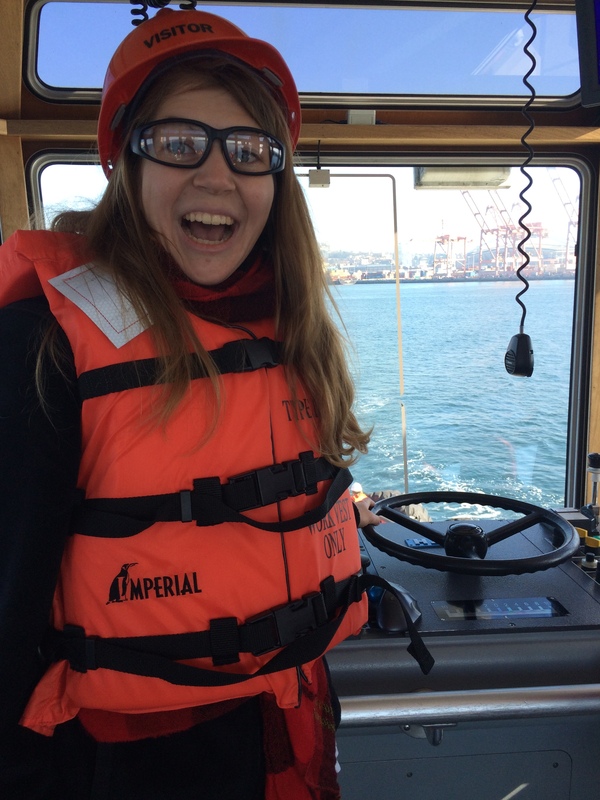 Read the final installment of Spring ’14 blogger Alex M’s reflection on the Pacific Northwest field seminar this coming Monday! 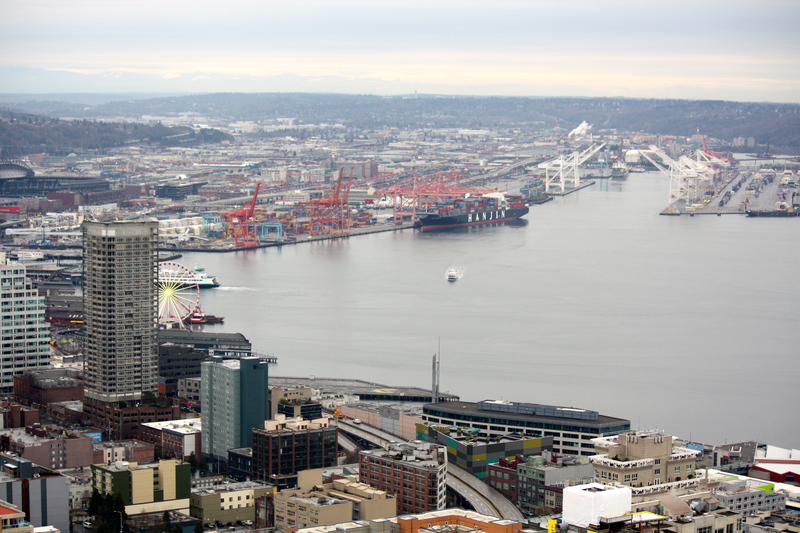 A bird’s-eye view of the Port of Seattle, taken from atop the Space Needle. 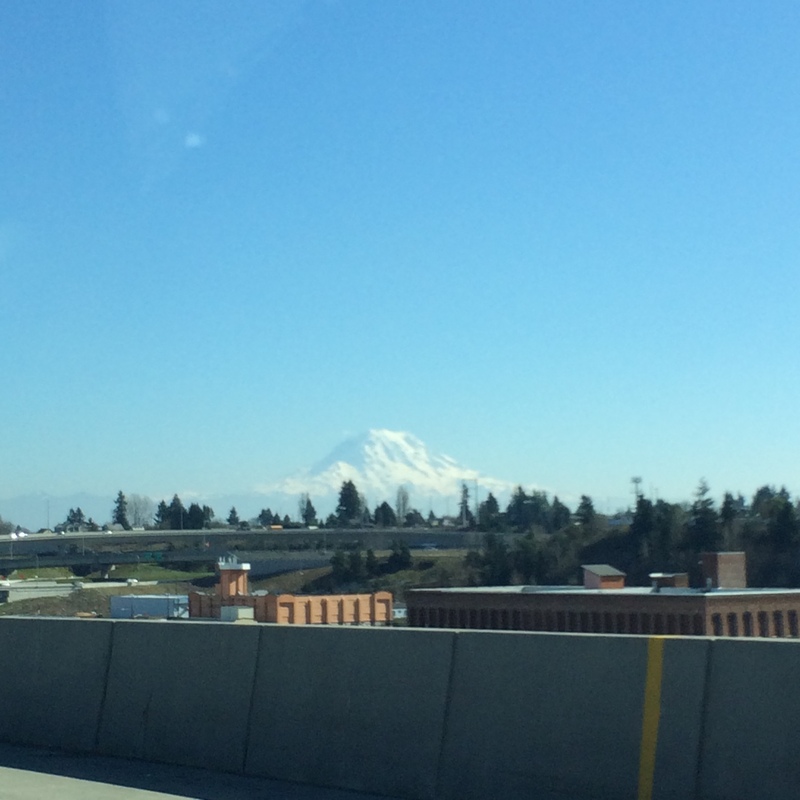 Perhaps only Ursula K. LeGuin, the current author of examination in our literature class, can define my emotions upon reflecting on our experiences in the Pacific Northwest: “I felt truly awed by the presence of majesty” (Searoad, 179). This majesty could be found everywhere, from the physical vastness of the land and sculpted sand dunes to the thick vibrant trees of pine and waves carrying masses of water to crash again and again against the dark faces of unyielding rock cliffs. Characterized by space and wilderness, I’ve never been in a place so self-conscious. The mountains are as aware of their steady hold in the landscape as the inhabitants are of the delicate state of their salmon populations. How refreshing to see this harmony, where man is not apart but a part of nature. This sense of insignificance unified our group of seventeen as we traveled from Seattle to Coos Bay in Oregon in what my classmate Hannah so aptly dubbed the “Sampler Seminar”. I have yet to absorb all of the lessons from this trip that I’m sure will hit me at some unforeseen point in the future. As I sit here, though, I think back on the memories that have impressed themselves the most in my mind. Our flight to the Pacific coast seems so long ago. From a 3:45 am departure, we flew for six hours and then plopped ourselves in the four minivans that would be subject to all sorts of physical abuse during the rest of our road trip. We took off straight for the Space Needle and ascended to catch our first glimpse of Seattle. Amidst the cloudy skies that became a permanent part of the landscape throughout the rest of our exploration, we looked out upon skyscrapers that loomed below us. The mountains were barely discernable through the fog on the horizon, and Puget Sound was covered in sailboats and ferries in spite of the forty-degree chill. After our descent, we were greeted by a professor from a local college who gave us a brief overview of the geological forces that shape the landscape in the Pacific Northwest. She was the first among many knowledgeable and influential people that we met along this coastline, as alums, friends of the program, and old faces anticipating our visit surfaced at every stop. The rest of our time in Seattle was a whirlwind: we met with environmental planners from the Port of Seattle and learned about restoration of the industrialized marshland, took our own personal tour of Puget Sound from the water on a Crowley tugboat, shrieked with delight to see the iced fish flying around Pike’s Place every time a brave soul placed an order, and carefully designed a Williams-Mystic logo with our own tropically-flavored Bubble-Yum on a wall already decorated with layers upon layers of gum. After only two days of whetting our appetites to Seattle’s unique culture, we were whisked down the coast, the tall buildings transforming to conifers through the van windows almost immediately outside the city lines. 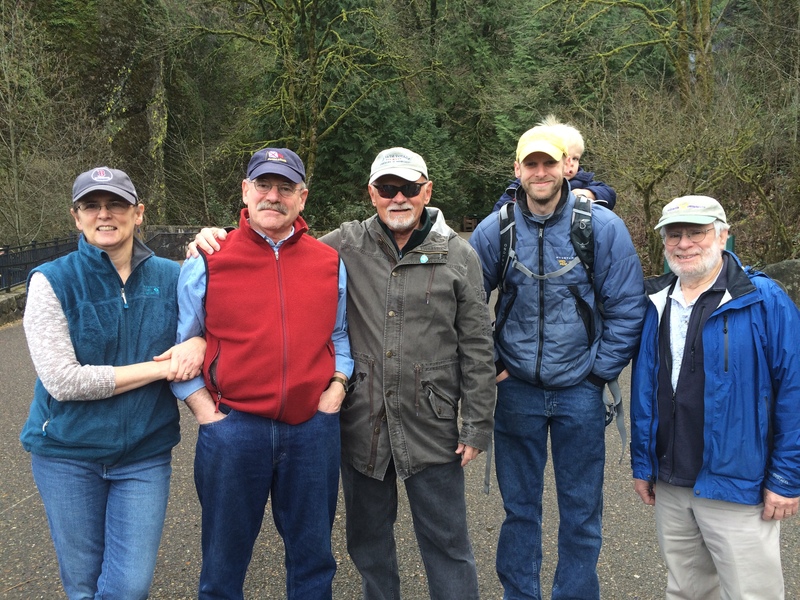 Check back soon for Part II of Spring ’14 blogger Alex M’s reflection on the Pacific Northwest field seminar! Time between trips here at Mystic seems short, maybe because of all of the exciting activities and classes our days are filled with, and maybe because time between trips is, in fact, short! A few quick weeks after finally touching land after our 10 days aboard the Cramer, we were off again—this time to absorb the beauty of another coast altogether in the Pacific Northwest. Our Pacific Coast Field Seminar began on Saturday, March 2nd in Seattle’s SEATAC Airport, where we began the first of our many hours in the five rental vans that became our pseudo homes for the duration of the trip. 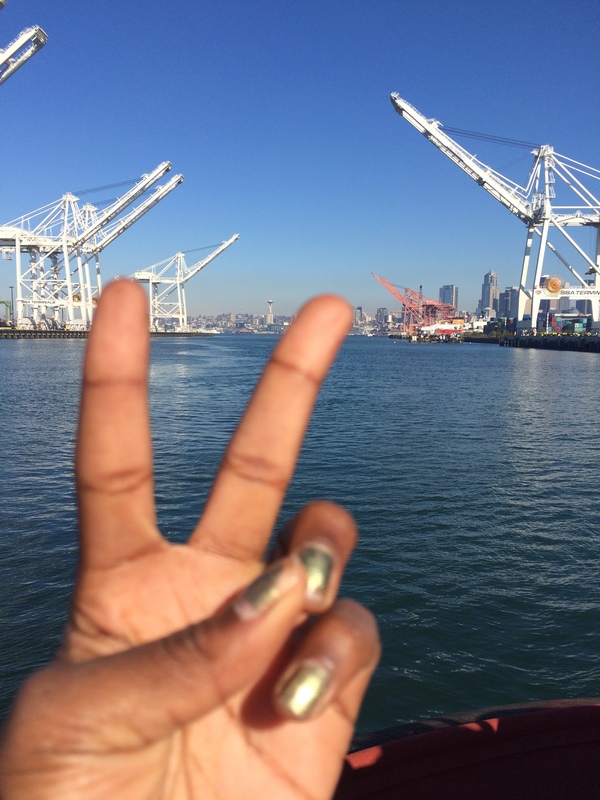 We loaded our bags into the trunks, buckled up and began our trip down the West Coast. 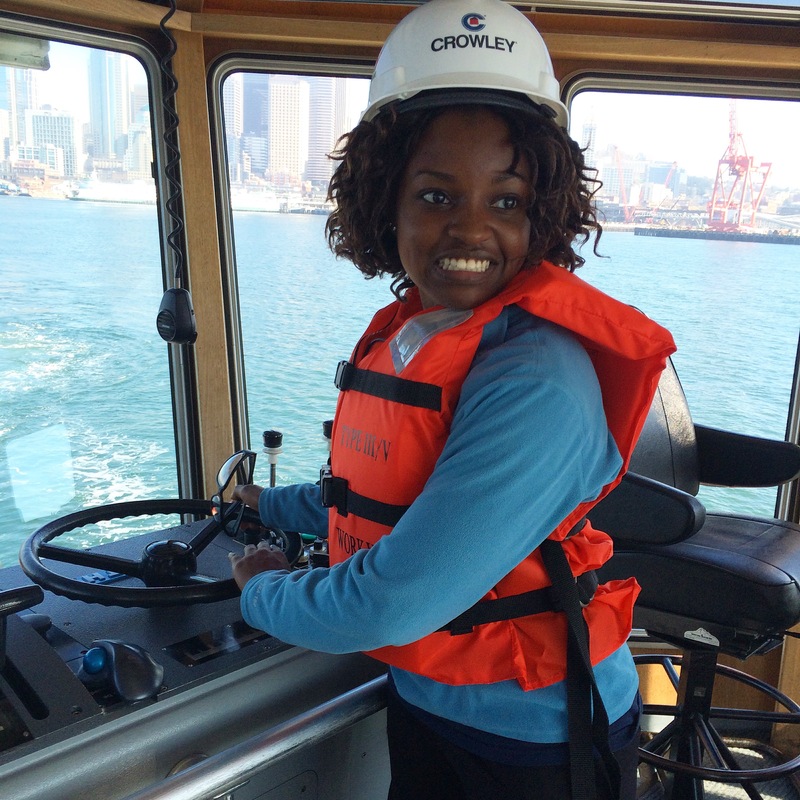 We headed first for the heart of Seattle, where we ascended the Space Needle for a birds-eye view of the unique and vibrant skyline, the port of Elliott Bay, and the Seattle-Tacoma shipping ports. 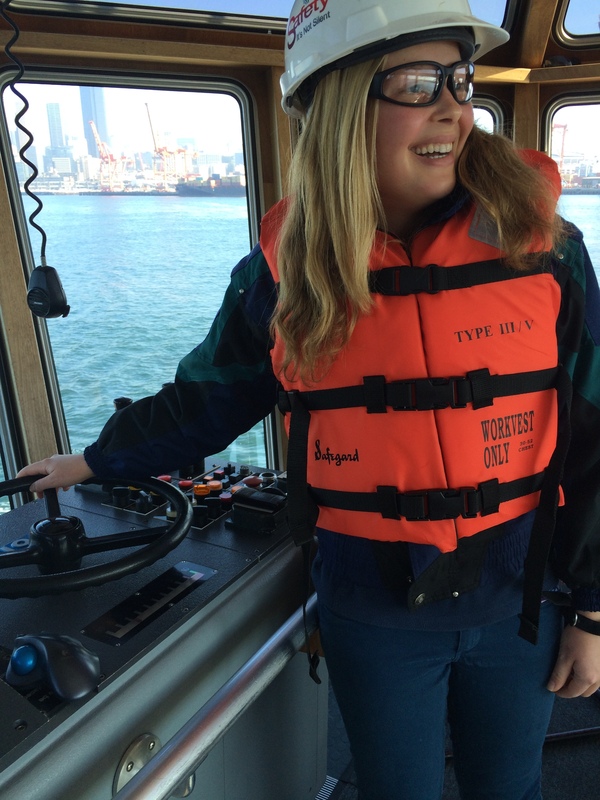 Our stay in Seattle was focused on containerization and the evolution of the cargo shipping industry, illustrated quite vividly for us by a trip on a Crowley Marine tugboat. Before leaving Seattle, we poked around Pike Place Market, visited the Klondike Gold Rush National Historical Park Visitor Center, and saw the largest commercial fishing port in the country, known as Fisherman’s Terminal. After spending our final night in the historic College Inn, the only remaining building from the Alaksa-Yukon-Pacific Exposition, we left for Oregon, stopping at Powell’s Books (the largest new and used bookstore in the world!) 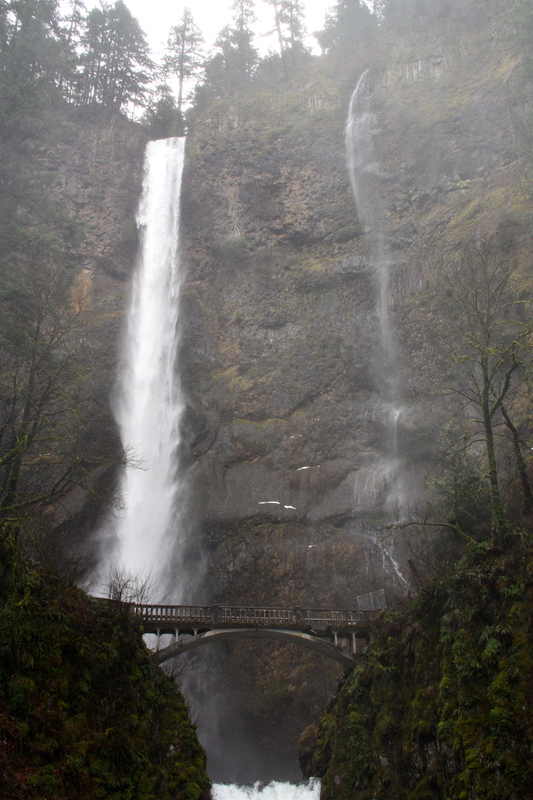 and Multnomah Falls for a quick hike. The next few days felt like a blur, arriving in Astoria, OR where we got to spend the night at the Columbia River Maritime Museum and stroll along Cannon Beach. Our days were filled with observing tidal creatures along Haystack Rock, one of the most photographed views of the Oregon coast, bonding with sea lions in the largest sea cave in the world, and tumbling down the largest dunes any of us had ever seen on the Oregon Dunes National Seashore. 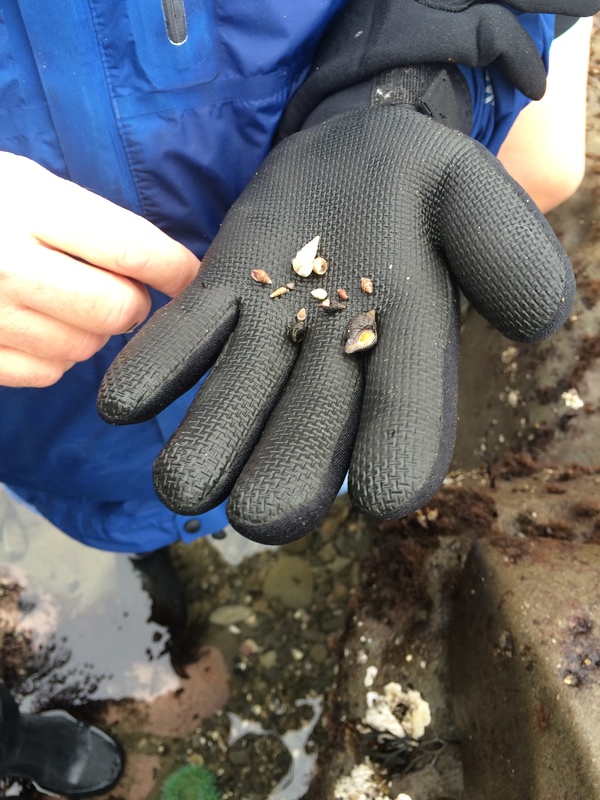 We finished up our trip with even more adventure, clambering around marshland and estuaries at the South Slough National Estuarine Research Reserve and interacting closely with marine biota in Cape Arago tide pools. With all of the incredible sight-seeing and touring we did in these eight short days, it seems we would’ve come back home with nothing but memories of the beautiful sights we saw and the incredible history and biology we learned. Instead, we stepped off the plane laughing about the times we shared with professors in vans, the incredible food we ate, and the extraordinary people we met along the way. Time and time again, Williams-Mystic proves that there is room in a day for more than any of us ever thought possible, and still somehow leaves us wanting more. Lucky for us, our next trip is right around the corner: Louisiana is a few short days away, and none of us can wait to see what adventures are in store!